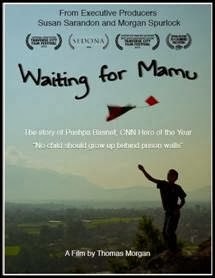 Waiting for Mamu is one of those films that restored my faith in humanity. The film, executive produced by Morgan Spurlock and Susan Sarandon, tells the story of Pushpa "Mamu" Basnet, a woman in Nepal who takes children out of prison and raises and educates them. The children she raises are children who have been put in jail with a parent due to a law in Nepal that requires a child to go to prison with a parent if there is no local guardian around. In 40 minutes, Thomas Morgan manages to tell a truly remarkable story with heart and love. He gives us a portrait of a hero and shows her influence on the lives she has changed. Many of the children she has taken in come from broken or abusive homes. Many of these children would be uneducated and forced into a life of crime if it wasn't for Basnet. A few children are interviewed, and this gives us another angle of this story. While we see quite a bit of footage of Basnet, the footage of the children gives the film another dimension since we are able to see firsthand the good Basnet is doing. Basnet thinks of these children as her own and they think of her as their mother. Morgan doesn't go for sentimentality and doesn't try to pull at the heartstrings - he doesn't need to. Basnet's story is so beautiful that it speaks for itself. As a film, this is truly a full emotional experience. If it were not for movies like these, many of us would never know about the small heroes making the world a better place.